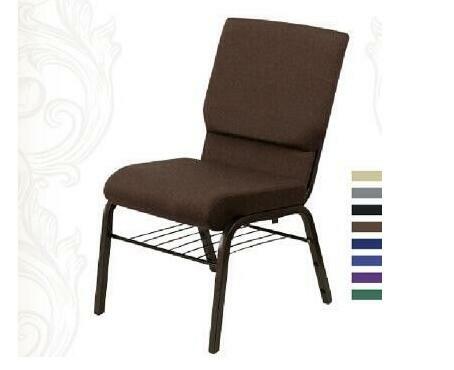 Today nearly 85% of church seating purchases are stackable, upholstered, metal frame chairs. This figure includes both new church construction and facility renovation. The days of wooden pews are long gone. The trend of theatre style seating made popular by the “mega-church” boom is declining in popularity. It’s for good reason that church seating has evolved to upholstered, metal frame chairs. Pews are expensive, comparatively uncomfortable, and take up more space than church chairs. Theater seats can cost three to five times that of an equally comfortable and durable quality stackable chair designed for sanctuary use. Further, because both pews and theater seating are anchored to the floor, the space usage is limited to worship or audience venues. While there are many providers of chairs for worship and sanctuaries, not all provide the same quality of products. Here is a quick checklist of what your church should look for in a quality church chair or seating for your sanctuary. • True 16-gauge, heavy-duty, cold-rolled steel. The 18 gauge steel is 30% weaker as the higher the gauge, the weaker the steel. • Free from rust. Check by opening the floor glide and running your finger inside the barrel. Poorly prepared steel will bleed rust in coming years. • High-quality paint that is laboratory certified safe from lead and other toxic chemicals. The paint should be an electrostatic applied powder coating. • At least a 25 year to lifetime warranty on the entire frame and not just the welds. • A third party/fabric manufacturer should certify all fabrics as to their double rub wear ability. The minimum is 100,000 double rubs per Wyzenbeek test. • Fabrics should be laboratory certified free from dangerous formaldehyde emissions and meet or exceed government and industry standards for safety. • All Foam should be high density, quality commercial-grade and laboratory certified free from dangerous formaldehyde and TDCPP (fire retardant) emissions. In addition, they should be certified to meet or exceed all appropriate state fire code standards. • Foundations should be high-quality industrial grade plywood (and not cheaper/weaker imitation particle board) or quality Polymer foundations secured to the frame with the use of quality T-Nuts to ensure long problem-free use. • Make sure you are receiving an easily understood chair warranty that will provide replacement chairs free of cost to you in case of problem. Be particularly careful of a requirement that your church pay for the shipping of the defective chair and the replacement. This game assures the chair provider that you’ll never exercise your warranty. • A free chair sample should be provided to your church. Be careful if a provider won’t send a free sample or cannot promise that your chair order will be exactly like the sample you received. • Limit your purchases to established church chair providers with proven long term reputations for sourcing quality products, service and integrity. Check their financial backgrounds to see if there are prior bankruptcies, financial improprieties or failure to deliver paid-for products. Be particularly wary of stocking warehouses providing discount chairs. Their business model is based upon acquiring the cheapest chairs possible for resale and rarely will these chairs meet all the previously mentioned standards. Your church’s chair purchase is a major investment. Seating is a major capital expenditure and deserves careful consideration. If done properly, your church will enjoy many years of comfortable and trouble-free use. If not done carefully, the result will be frustration, disruption in your ministry and the loss of thousands of dollars.